The Carry of the Month for July is the Onbuhimo demonstrated by Liz Witt, Volunteer Babywearing Educator for the Babywearing International of Phoenix Chapter. The Onbuhimo is a traditional Japanese style carrier that has been worn since the Kamakura Period in Japan. 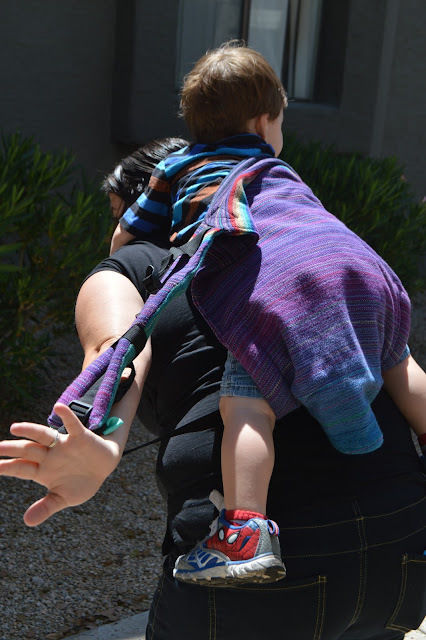 Traditionally babies were carried high on the backs of their caregivers in an Obi belt. Later back support was added for the baby and the Onbuhimo came into use. The word Onbuhimo is derived from two Japanese words, Onbuhimo describing the act of carrying a baby on the back, and Himo, meaning long strap or rope. This is a description of the components of the modern day carrier. 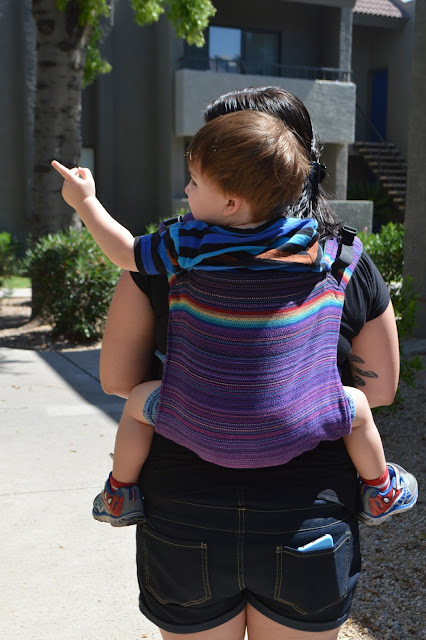 In Japan and western babywearing the addition of the ring and buckle waist have added ease of use to the carrier for the wearer. 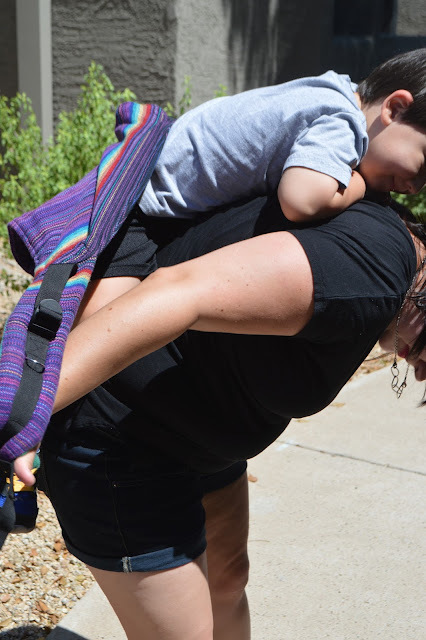 The Onbuhimo is available as a ring waist with wrap style straps from the shoulders, padded shoulders with webbing and buckles, and as a reverse with rings at the shoulders and wrap straps at the waist. Despite the number of options, the Onbuhimo is worn as a front carry or more traditionally as a back carry. 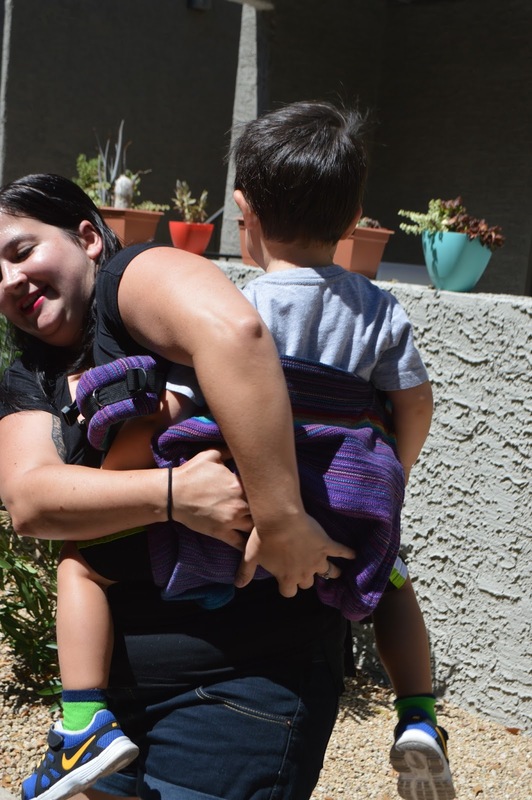 The carries are high, at the center of mass of the wearer, using the strength of the back of the wearer and abdominal core muscles to sustain the carry. 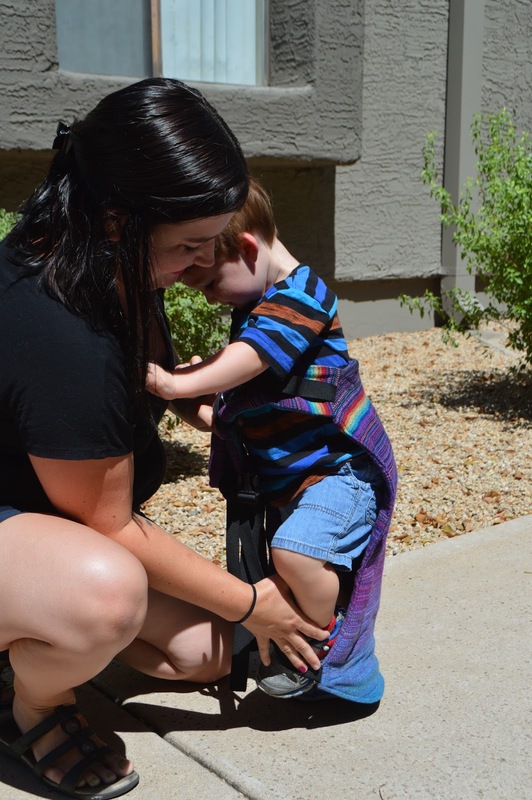 As with any panel style carrier the baby being worn should be sitting unassisted before attempting any back carries. Liz will be demonstrating wearing a buckle style Onbuhimo. Before you begin loosen both straps on your carrier extending the webbing as far as it can go. If present, adjust your personal fit adjusters (PFAs) to your comfort level. Adjust your chest clip low to sit across the top of your chest. 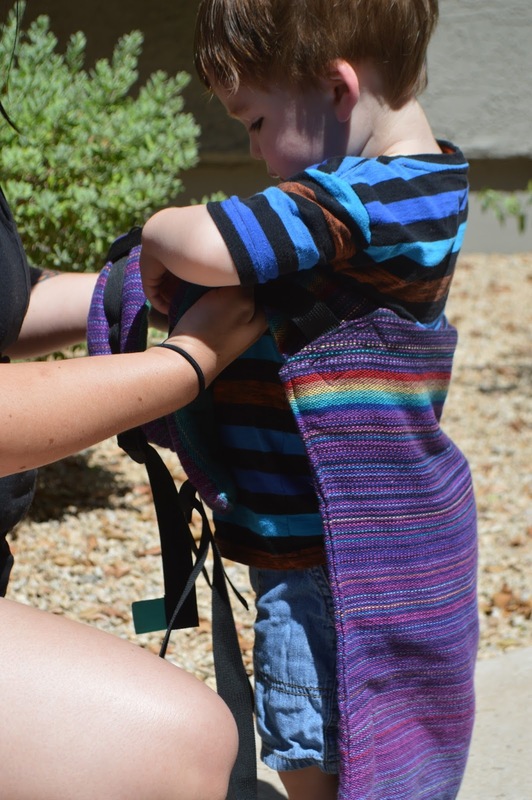 Place baby's legs in the loops created by the shoulder straps. The shoulder straps should be placed under bay's arms or over the shoulders. Holding the shoulder straps in your hands cross your arms one over the other. The arm in the direction you are swinging baby onto your back should be crossed on the top of the other arm. Here Liz is swinging over her right shoulder so her right arm is over her left. In one swift motion lift baby up and over your shoulder to your back. Place your arms into the shoulder straps one at a time, holding baby with one hand as you do. Tighten the webbing on the shoulder straps. 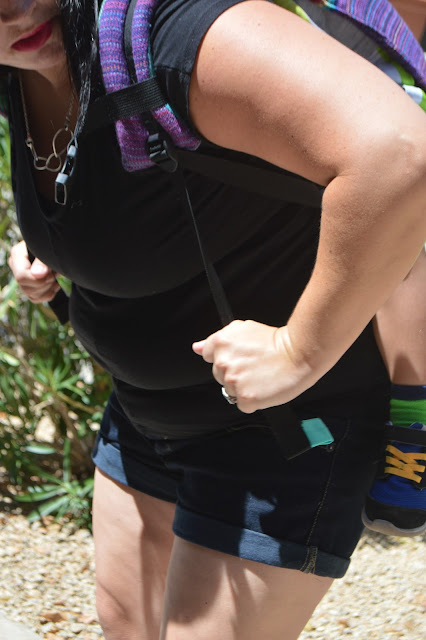 Loosen the webbing on your shoulder straps and chest clip. Place your baby's legs into the loops for the shoulder straps. Place your baby on your hip. 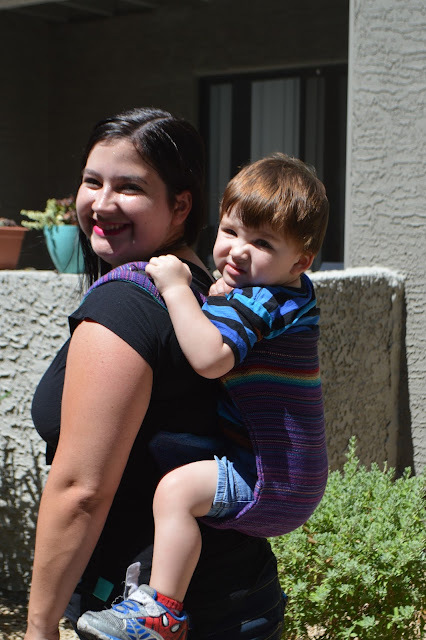 Slide your baby to your back holding one hand on the back and switching hands halfway. Holding baby with one hand slide your arms into the shoulder straps. Buckle your chest clip and tighten. Check and adjust baby's seat to make sure they are centered. That's it! You have completed a back carry in an Onbuhimo. 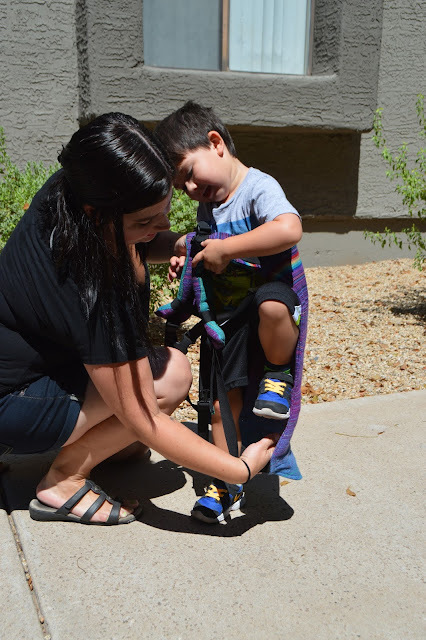 Loosen the shoulder straps and adjust the PFAs as needed. Place baby's legs in the shoulder straps. Pick baby up and place high on your chest. 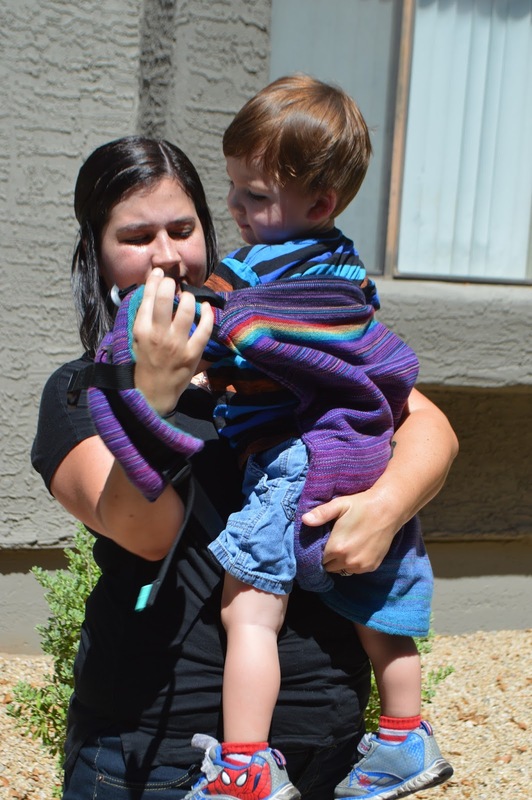 Holding baby with one hand, slide your arms into the shoulder harness. Trace the shoulder harness up with each hand to the chest clip. The prize for the Carry of the Month this July is a wrap scrap keychain with images to follow shortly. 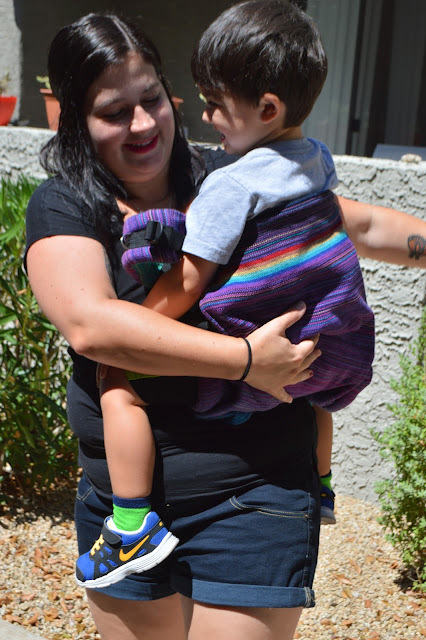 To enter to win, simply post a photo of you trying out SSC Hip Carry on the COTM thread in our Facebook group, if you're not on Facebook email your entry to us at PhoenixBabywearers@gmail.com. March 2017 Note: This post has been edited. This carrier style name used to be incorrectly shortened to Onbu. We are using the correct terminology now as recommended by the statement at #NotYourPodBuTai. You can read the statement here and Babywearing International's statement in support of this statement here.